My all-time favorite Filipino dessert dish is Biko – a sticky rice dessert that is sweetened using coconut milk and coconut cream with a hint of orange. As a kid, it was one of those treats that I only ate when my parents took me to gatherings at Filipino parties. For nearly 10 years I have been searching for a recipe that I could make on my own so I could have this treat any time I desired. Finally, I found a suitable recipe that satiated my need. A few weeks ago I came across a recipe at DeliciousAsianFood.net for sticky rice. It calls for only four ingredients. This dish, while it does take some time since you have to make sure the rice and coconut mixture doesn’t burn while on the stove, is well worth it. It’s also quite similar to a recipe that I learned about five years ago. While working on a documentary about Filipino food for Emerson (yes, a documentary that is still yet to be completed – although that is a completely different story), I interviewed a Filipino-American family in Milwaukee. Mom, was born in the Philippines, but her husband is from the U.S. and met his wife while working as a missionary. They have three children. Mom’s mother, “Nana,” now also lives in the U.S. The family uses food to tell the children about their rich Filipino heritage since the children have yet to visit their mother’s homeland. I was lucky enough to be welcomed into this gracious family’s home and learn some of their recipes from the Visayas region of the Philippine Islands. One of the dishes that Nana showed me how to make was Biko. Even though she didn’t speak much English, food is a universal language. It was easy to understand what she was trying to say about the ingredients and what to do. Her recipe for sticky rice was quite similar to this recipe that I just found. When I recently found this online recipe, it reminded me of the time I spent with this family and how much we pass along to future generations through food. Food is a natural story-telling element. Each family has their own ways of producing recipes and traditions. For instance, in an Italian family, no red sauce is probably the same. Some say you need “x” amount of this ingredient, while others would say that it’s a no-no. Because of those traditions, it gives each family their uniqueness, and it stems deep into that part of our memory that takes us to a place that recalls a simpler time. When I think of biko, I think of going to parties on Saturday evenings with my parents at the houses of another Filipino families. There would be a large communal table of food – pancit, lechon, adobo – so many dishes to choose from. You could never fill your plate high enough and you could never eat enough to make the host happy. After dinner, everyone would gather around the karaoke machine. My Dad’s favorite song was Nat King Cole’s “Unforgettable.” Another friend sang Bobby Darin’s “Mack the Knife.” Other men who weren’t into singing would critique their golf swings in the living room. Wives of the group would sit around, talk and crochet, knit or latch-hook. I remember that’s where I learned to latch-hook from one of the older Filipino matriachs. If there were other kids around, we would run around, playing games and nibble off the left over pieces from the crispy lechon carcass. It was nights like that, that I remember so dearly as quality time with my parents. So, it’s as I made my first-ever batch of biko the other night after a long day at work that I found myself reminiscing quietly to myself while stirring away at a hot mixture of sticky rice and coconut milk. It was an oddly serene moment where, for once in a long time, I felt very at peace with my life. I take pride in the dish that I made, even though it was by no means perfect. The perfection is something that will come with time, if ever at all. But it’s the stories that come along with the trials of trying the recipe that are the most important part. 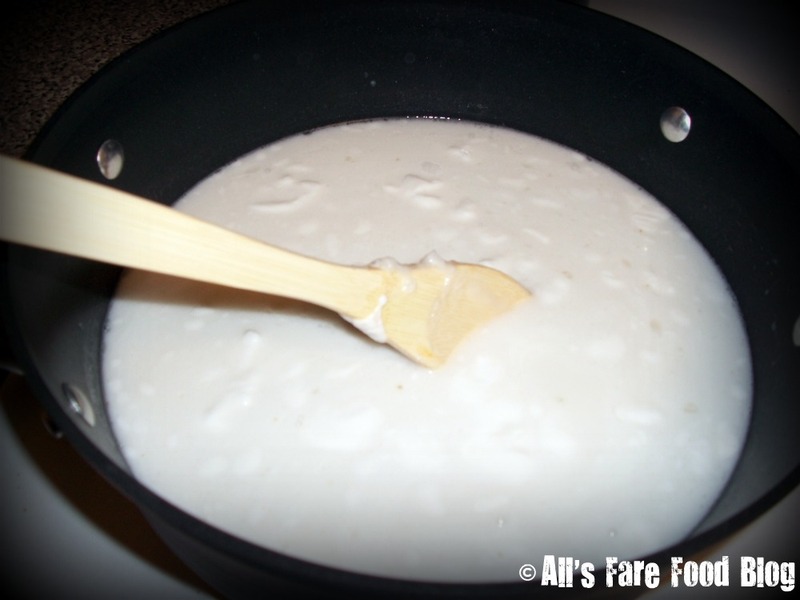 Pour the coconut milk and a cup of water into a pot over medium heat until it comes to a simmer. 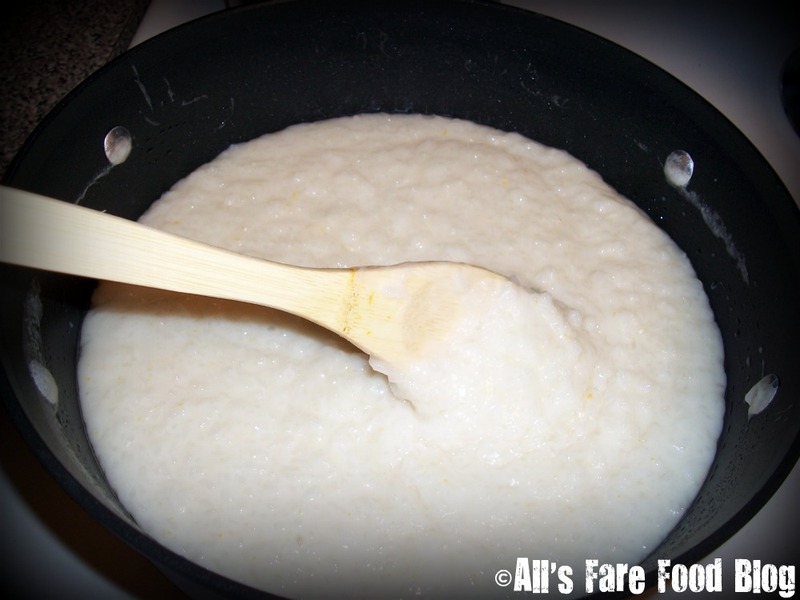 Once the coconut milk and water is simmered, add the cooked rice. (I didn’t have enough coconut milk so I used some more coconut cream in its place – I think that’s where part of my problem later on came in.) Also, I really like how orange essence tastes in this dish. Nana just used a hint of the orange rind to give it another level of flavor. I did the same with my version. Stir constantly to prevent burning. The rice mixture is complete when it looks like a risotto or porridge. Nana told me when we were cooking that you can draw a spoon through it and it will stay apart for a few seconds before the parted rice “sea” returns to normal. The recipe online said this process will take about 10 to 15 minutes. It took me about 40 minutes (I also think my stove and oven run low.) Once the rice is set, add 1 cup of brown sugar and stir until it is incorporated. I think the recipe is good to go and complete here. Just stir well and take the pot off the heat. Lightly butter a 9×13 pan and pour the rice mixture into it. Bake for about 1 hour until it is caramelized. Cool before serving. 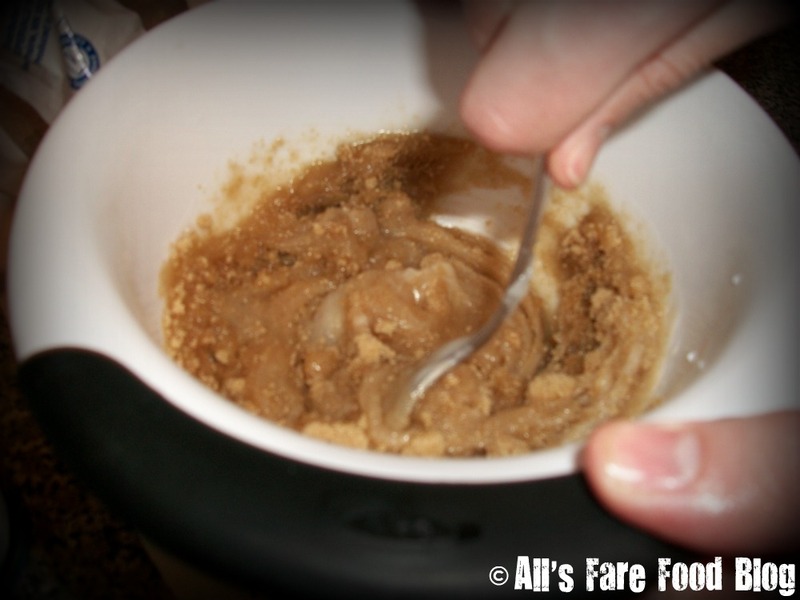 However, the Delicious Asian Food’s recipe adds this step – Mix 1 cup brown sugar and the coconut cream. Pour over the top of the smoothed rice mixture that is in the pan, then bake. Brett and I found this addition to 1) be much too sweet and 2) the coconut cream separated after it cooled. I also think that this step, along with adding the additional coconut cream in place of the coconut milk in step 1, lead also to the cream separation. I’ll only know when I make the recipe again and I omit this last step with the topping. Store the leftovers in a covered dish in the fridge. You can enjoy it cold. 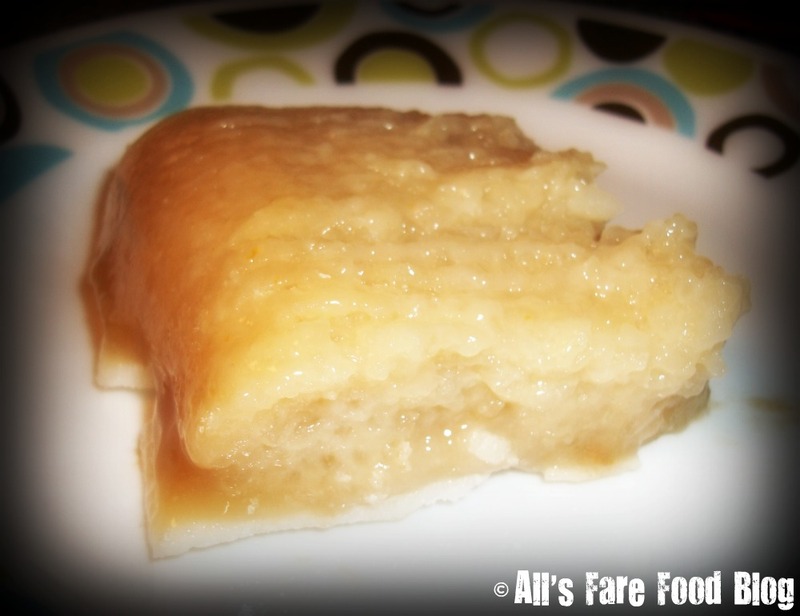 This entry was posted in Cuisine - Desserts, Cuisine - Filipino, Recipes and tagged Biko, coconut cream, coconut milk, DeliciousAsianFoods.net, desserts, Filipino, recipe, sticky rice by Christina. Bookmark the permalink. I read your post was just surfing and (I’m 62) my grandma died in1998. I had the same Child hood memories of Biko!!! I have been looking for a biko recipe where the rice is not made very sweet but the topping is thick, grainy (like packed sugar but with dark brown latik color so as not to be chewy). It is easy to make the rice less sweet but the topping recipe is what I am looking for.The topping is not chewy yet also not crumbly. Watch this video: http://www.youtube.com/watch?v=SXUIjE9ZZ6s which shows the biko consistency that I am looking for. biko is my favorite phillipino desert also some koreans like it and i know cause my clase mate charles is korean and i brought coconut rice to school and when he tried it he accutly liked it!